A GOOD STORY - The Rough Notes Company Inc.
“2015 is a good story,” announced NCCI’s new President and CEO Bill Donnell, CPCU, ARM. 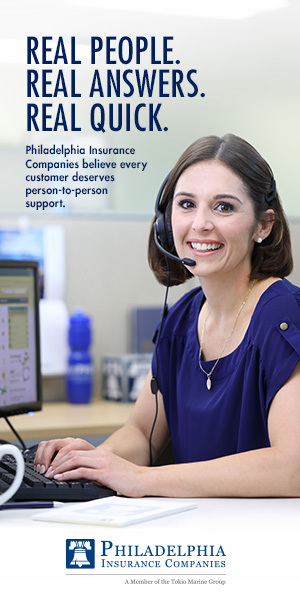 “Insurers are doing very well overall. 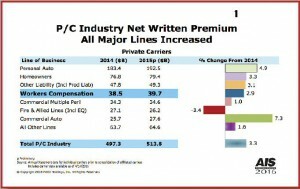 Premiums and payrolls are growing.” Speaking at his first Annual Issues Symposium, Bill held up the tradition of the word and declared that this year the workers comp industry was “transforming.” And therein lies the rub. All major lines of business showed an increase in premium with the exception of fire and allied lines which benefited from low catastrophe losses. (See Chart 1.) The biggest gains occurred in the auto lines, both personal and commercial, as record auto sales were boosted by low gas prices and low interest rates. On the other hand, although the line continued to enjoy an underwriting profit, the combined ratio rose one point to 98, as the increased number of autos on the road managed to get into accidents. (See Chart 2.) 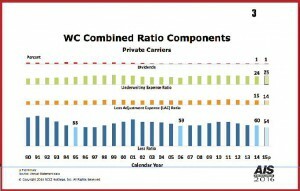 The combined ratio for workers comp improved by six points to 94, resulting in “one of the best underwriting results we’ve had in decades,” Kathy noted. The six-point improvement was solely due to a six-point drop in the loss ratio. (See Chart 3.) The 54% loss ratio is “the lowest it’s been in 25 years,”Kathy said. 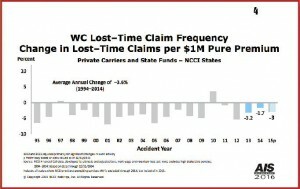 The improvement in the loss ratio certainly benefited from a continuing decline in frequency of lost-time claims of about 3%, as well as a surprising decline in medical claims severity of 1%, lowering the average medical lost-time claim to $28,500 in 2015 from $28,800 the previous year. (See Charts 4 and 5.) “That was a really interesting development,” Kathy commented on the medical severity decline. 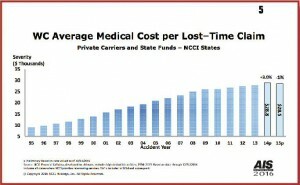 Several states have seen medical utilization declines, she continued, and equally important is the impact of cost management efforts. 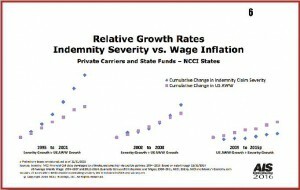 “These efforts have actually been a part of the workers compensation landscape for many years, and now it appears we’re finally seeing enough of an impact to decrease medical severity.” At the same time, indemnity claim severity rose only 1% to $23,500 in 2015 from $23,200 the previous year. So, to reiterate, 2015 was indeed a very good year for workers comp. But there are indications that part of the “transforming” that is taking place may result in future years not being quite so fine. 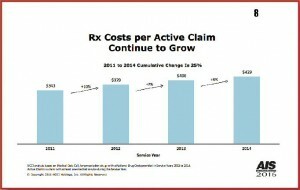 While the change in medical severity was welcome, “we’re still seeing issues related to prescription drugs,” Kathy noted, as the average cost of drugs per active claim rose 6% to $429. (See Chart 8.) 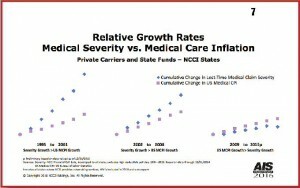 And, while the increase is less than in previous years, it still is unsustainable long term. Another problem is all too typical in a line that, as many observers have noted, “can’t stand prosperity.” As Kathy noted: “The underwriting cycle is alive and well,” and it’s time for a soft market. The fact that the previous cycle was milder and shorter than earlier cycles bodes well for the future, but with the excess capacity the line is enjoying, the length and breadth of the next soft market certainly has to be of some concern. 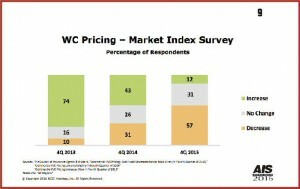 The latest CIAB survey would seem to indicate that rate decreases have become the order to the day. (See Chart 9.) The survey shows that in the fourth quarter of 2015, 57% of workers comp policies showed a decrease in rates, while only 12% had increases. Only two years ago, 74% of workers comp policies faced an increase and only 10% were down. This is a pretty fast reversal, particularly in light of the continued low interest rate environment that should preclude cash flow underwriting. And then there’s the Castellanos case where the Florida Supreme Court overturned the attorney fee schedule that was promulgated into law in 2009. The ruling found the fee schedule unconstitutional under both the state and federal constitution because it violates the right to due process. While the case was mentioned briefly at this “issues” symposium, nothing substantial was said other than NCCI was evaluating its impact to determine how much of an increase in rates was needed. For those insurers that have been involved in workers comp litigation in Florida, a rate increase may not be sufficient to recoup from what could be unfunded liabilities going back to 2009. There also has to be concern that the court found the schedules unconstitutional. Will this spill over to other states? It would certainly seem likely that attorneys in other states will be looking at this ruling and preparing to challenge the fee schedules in their state. Of course, the biggest concern for agents and their clients is the growing use of predictive modeling mentioned above. We have already had reports from agents whose clients faced increases based on the use of predictive modeling, even though those same clients had successfully improved their mod. 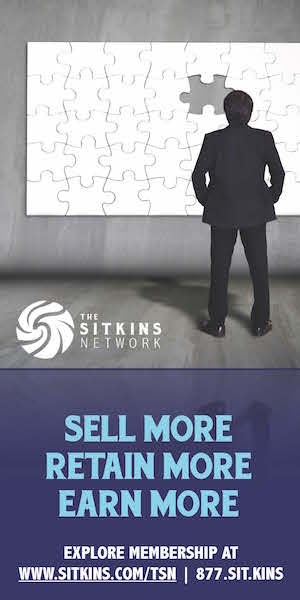 When one agent asked the company where the client needed to improve, he was told that the company didn’t know but the model indicated an increase. Agents have spent a great deal of time working with their clients to lower their cost of risk by incorporating important loss mitigation and safety procedures that helped to lower a client’s mod and ultimately reduce the cost of workers comp coverage. If the line moves away from the mod in favor of predictive modeling that may or may not improve underwriting, it had better take into account the downside of such a move in that they will be alienating their best customers (those who have made the effort to improve their mod) and their agents. The growth of the alternative market can, in many cases, be traced to this type of opacity in ratemaking. The use of the mod has made comp one of the most transparent coverages when it came to rates and one in which a partnership between companies, agents and clients created a win-win-win situation. A move away from the mod must offer an equal amount of transparency or there will inevitably be further erosion of good risks as they find ways to leave the traditional market in favor of an alternative.